Syria Notes No. 15 focuses on Idlib, and on the ongoing struggle over governance between local councils, civil society, and armed jihadists in this opposition-held province of Syria. 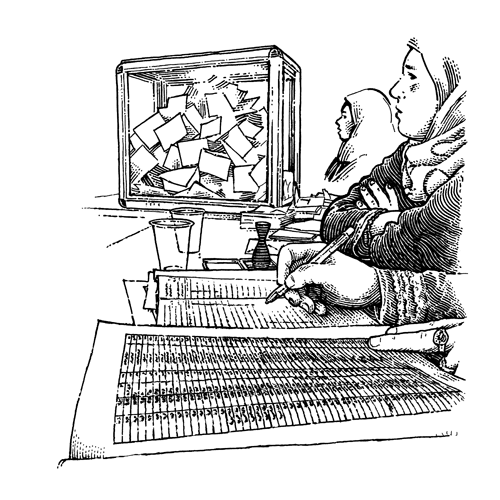 Illustration: Election workers in Saraqib, 18 July 2017. View and download a PDF of this issue. Previous issues of Syria Notes can be found here. To join our email list or to request print copies, please contact secretariat@appgfriendsofsyria.org. Printing of this issue has been funded by Lush Charity Pot. Over the past year, the Assad regime and its allies have forced several tens of thousands of people out of besieged towns and cities, with most of them sent to Idlib province. Last year 8,000 people were removed from Daraya, 3,000 from Moadamiyeh, 2,000-3,000 from Al-Tal, and 34,000 from eastern Aleppo city, according to Siege Watch reports. This year, the distinctive green buses continued the forced displacement with several thousand transported from Wadi Barada, over 3,000 people from Madaya, and between 12,000 and 20,000 from Al Waer. Over 900,000 internally displaced people are estimated to be in Idlib province according to IDMC, in an area which had a pre-war population of just under 1.5 million. An even greater number of internally displaced people are in neighbouring Aleppo province. As this forced displacement has continued, Idlib has seen fighting for military control between Al Qaeda-linked jihadists of Hay’at Tahrir a-Sham (HTS) and other armed opposition groups. HTS has also been trying to take political control from the many local councils that have arisen since the 2011 revolution. In some parts of Idlib, most famously the town of Maarrat al-Nu’man, there has been a strong civil resistance to HTS’s power grab, with daily street protests against the jihadists sustained over several months. Now NGOs and civil society groups are fearful that the rise of HTS will lead to cuts in humanitarian aid from abroad. Martin Chulov of The Guardian reported at the end of August that ‘officials in Whitehall are examining whether Britain will continue to honour up to £200m in aid for local populations in Idlib and communities exiled from elsewhere in Syria,’ and that Germany is also considering suspending its aid program to Idlib province. 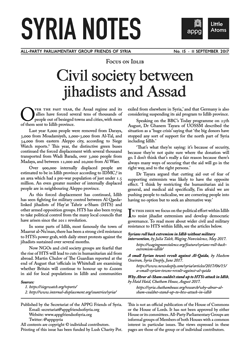 In this issue we focus on the political effort within Idlib to resist jihadist extremism and develop democratic governance.